An online petition has been started to name the recently photographed black hole after Chris Cornell. The very first image of the colossal cosmic phenomenon was shown earlier this week – and music fans want to use the occasion to pay tribute to Cornell and Soundgarden’s 1994 track Black Hole Sun. The petition was started by Giuliana Jarrin, who says: “Almost two years ago, we lost Chris Cornell. 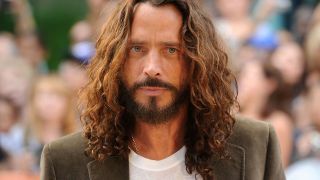 He was the lead singer for Soundgarden and Audioslave, and above all, the voice of an entire generation. “He was one of the most beloved figures not just in rock, but all of music, by people from all over the world. His music, his voice and his personality inspired, influenced, changed and even saved the lives of thousands of people. “Chris left a heavy legacy for a new generation of musicians who follow in his footsteps. His memory will remain forever alive in the hearts of all his family, friends, fans and all the people who love him, and his music will do the same in each record, song or video we play. “I ask NASA, the Event Horizon Telescope Collaboration and all the astronomers and scientists involved in this discovery, to name this black hole after Chris Cornell. Despite Jarrin’s best efforts, the black hole has now been branded Powehi – a Hawaiian name referring to the “embellished dark source of unending creation”. But you never know, maybe they could add Cornell’s name to it in the future.